Following Brett Kavanaugh’s nomination to the Supreme Court, there was much discussion about the future of reproductive rights in the United States and whether his appointment could result in the overturning of Roe v. Wade. While that prospect remains a real threat, abortion could be made as good as illegal for millions of people long before that happens. In 2016, the Supreme Court struck down abortion restrictions that would have closed most abortion clinics in Texas. Justice Anthony Kennedy was the swing vote in that case. With Kavanaugh confirmed as his replacement, the court could use the next abortion-rights case to eviscerate abortion access without explicitly overruling Roe. Ever since Roe was decided in 1973, state legislatures have been chipping away at abortion access, passing more than 1,100 restrictions. They include waiting periods, anti-abortion counseling mandates, bans on the types of procedure used, and forced ultrasounds. And then there are the TRAP laws — Targeted Regulations of Abortion Providers — that require abortion providers to have admitting privileges at local hospitals or require clinics that provide safe, outpatient care to meet the standards of ambulatory surgical centers. The TRAP requirements are difficult — in some cases impossible — to meet. Many hospitals simply won’t provide admitting privileges to doctors who perform abortions due to anti-abortion bias and stigma. 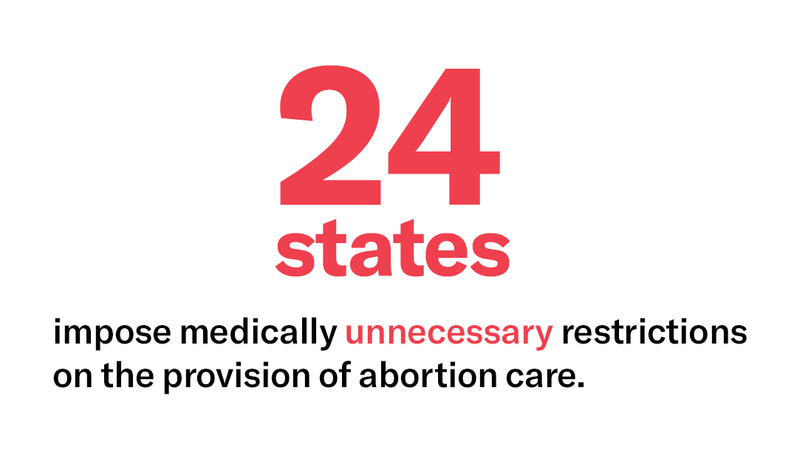 Others require doctors to admit a certain number of patients at the hospital each year, but because abortion is such a safe procedure, abortion providers can’t meet that threshold. Ambulatory surgical centers are far more complex and expensive than what is necessary to provide a safe abortion, and no other comparable medical procedure is subject to such requirements. Proponents of TRAP laws claim that they are intended to protect women’s health, but major medical associations oppose the requirements, saying they actually jeopardize women’s health by delaying and obstructing access to abortion care. In 2016, the Supreme Court agreed that the laws do not benefit women but rather impose unnecessary obstacles. In a decision called Whole Woman’s Health v. Hellerstedt, the Supreme Court struck down a TRAP law in Texas that would have required abortion providers to have admitting privileges and meet the requirements of ambulatory surgical centers. The court found that there was no evidence that that the measures protected women’s health. There was, however, overwhelming evidence of the burden they imposed on women by forcing three-quarters of clinics around the state to close, leaving millions of women without access to abortion. In a dangerous preview of what may lie ahead, judges on lower courts who disagree with Roe v. Wade, are already starting to ignore the Whole Woman’s Health ruling and uphold laws nearly identical to the one in Texas, forcing more clinics to close. It happened in Arkansas, where the state went down to a single clinic for a period this summer when a federal appeals court lifted an injunction against a TRAP law that was very similar to Texas’s. And it’s what happened just last month in Missouri and Louisiana, both of which are going down to one clinic each because appeals courts for those states have flouted the Supreme Court’s decision and allowed TRAP laws there to stand. Before those decisions, as of May 2017, there were already six states that had only one abortion clinic remaining. Soon, that number could increase to at least eight. And, if the Supreme Court gives the green light, some states may have no abortion clinics left in the not-so-distant future. Below, we look at just some of the states that are down to a single clinic or have seen a precipitous reduction in the number of clinics over the past 25 years because of abortion restrictions. Sadly, this is likely what more and more of the country may start to look like. In 1992, Arkansas had eight abortion clinics. Today it has three. And, depending on how a federal appeals court rules in a pending case, it could soon have only one. That is what happened over the summer, when a federal appeals court allowed a law virtually identical to the one struck down by the Supreme Court in 2016 to take effect. The Arkansas decision made medication abortion (aka abortion with pills) unavailable in the entire state by requiring clinics that provide the service to have an agreement with OB-GYNs who have admitting privileges at a nearby hospital. (Recall this is the same type of law that the Supreme Court found unconstitutional just two years ago.) And that could happen again — this time on a permanent basis — if the appeals court rules in favor of the state once more. In addition, we have challenged four other restrictions passed by the Arkansas Legislature, all of which have been blocked by a federal trial court. But the state has appealed. If the state prevails, these laws would act as an effective bar to having an abortion anywhere in the state. Arkansas also requires anti-abortion counseling, parental consent, and a 48-hour waiting period. It also bans abortions at 20 weeks. Counseling must be provided in person and take place before the waiting period begins, necessitating two separate trips to one of the few clinics in the state. In 1992, Kentucky had nine abortion clinics. Today it has one. The state has tried to use TRAP laws to shut down the single remaining clinic, but litigation has thus far blocked it from doing so. In September, a federal court held that the TRAP laws’ “scant medical benefits” were “far outweighed by the burden imposed on Kentucky women seeking abortions” and struck the laws down. However, the state has vowed to appeal. If the ruling stands, a second clinic is likely to begin offering abortion services. But there’s more. Kentucky already bans abortion after 20 weeks, but this year the state passed a law effectively banning abortions after 15 weeks as well. We sued and the law is on hold. Women in Kentucky are also required to have a face-to-face consultation with a doctor at least 24 hours before an abortion. Women under 18 must get permission from a parent or a judge in order to have an abortion. And doctors must provide an ultrasound, narrate fetal development, and make the heartbeat audible regardless of whether the patient wants to hear it. We are challenging the ultrasound law in the courts, too. Louisiana had 17 abortion clinics in 1992. Today it has three. And, due to a recent court ruling, it may soon only have one. That is because its clinic licensing law contains more than 1,000 medically unnecessary requirements, including an admitting privileges measure that is indistinguishable from the one struck down in Whole Woman’s Health. Yet the Fifth Circuit Court of Appeals ignored the clear and controlling precedent and allowed the law to go into effect. In addition to establishing licensing hurdles that are almost impossible to overcome, the law forces women to undergo invasive examinations, makes doctors give their patients misleading or false information, and allows the government to collect and review the medical records of every woman who has an abortion in the state. Moreover, the state passed a bundle of abortion restrictions in 2016 that, among other things, tripled the time a woman had to wait to get an abortion — pushing women later into pregnancy — and banned the most common method of abortion in the second trimester. In 1992, Mississippi had eight abortion clinics. Today it has one. From 1991 to 2014, the annual number of abortions in Mississippi declined by nearly two-thirds. The abortion rate in Mississippi is almost four times lower than the national rate, despite the state’s unintended and teen pregnancy rates being substantially higher than the national average. Until the measure was blocked in court, Mississippi required any physician associated with an abortion facility to have admitting privileges at a local hospital. It took eight months for the state to finally admit that there was no meaningful distinction between the Texas law that had been struck down by the U.S. Supreme Court in Whole Woman’s Health v. Hellerstedt and its own admitting privileges measure. 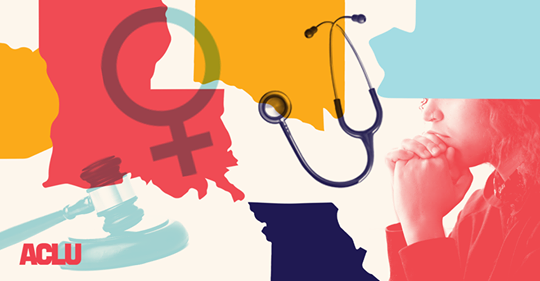 While several states have laws limiting the provision of abortion care to physicians, thereby preventing other qualified, licensed clinicians from offering this service, Mississippi takes it one step further by requiring abortion providers to be OB-GYNs. It is the only state to impose such a requirement. In addition to its clinic shutdown laws, a woman must receive in-person, state-mandated counseling intended to discourage her from choosing an abortion, wait 24 hours before she can return to the clinic, and undergo an ultrasound before she can have the procedure. A woman under 18 must obtain written consent for her abortion from both parents or permission from a judge. Mississippi was the first state in the nation to enact a ban on abortion after 15 weeks of pregnancy, which was the earliest abortion ban in the country at the time it took effect. The state also has a “trigger law,” which is designed to ban abortion immediately should the U.S. Supreme Court overturn Roe v. Wade. In 1992, Missouri had 12 abortion clinics. Last year it had one — until a federal district court enjoined its TRAP law, which allowed a second clinic to offer abortion services again. But now it has gone back down to one after a federal appeals court let two measures, virtually identical to the ones struck down in Texas, take effect in September. Beyond its TRAP laws, Missouri requires state-directed counseling designed to discourage abortion that must be provided by the same doctor who will perform the abortion. Following the counseling, a woman needs to wait 72 hours before she can obtain the procedure. Because the counseling must be provided in person, she must make two separate trips to the clinic. And with so few clinics in Missouri, a trip to the clinic could be 300 miles away. That, in turn, requires additional time off of work and possibly extra childcare costs, given that the majority of women who have abortions are already mothers. In 1992, Ohio had 45 abortion clinics. Today it has 10. First, the state required abortion providers to obtain a written transfer agreement with a local hospital. Then, it banned public hospitals from entering into such agreements with abortion clinics. Not satisfied with that Catch-22, the state also created an onerous process for abortion clinics to seek an exemption from the transfer agreement requirement and made the denial of a clinic’s application automatic if the Department of Health failed to act within 60 days. And while the statute only requires a clinic to have one backup physician in order to be exempted, the Department of Health demanded a showing of two, then three, and ultimately four backup physicians. It is only due to court intervention that the sole remaining clinic in Dayton is open today, and several other clinics are also in jeopardy of shutting down because of these laws. Even the retirement of one backup doctor could force a clinic to close. On top of these onerous measures, women must wait at least 24 hours after receiving in-person, biased counseling before having an abortion, requiring two trips to the clinic. Women under 18 must have a parent’s consent. Finally, women must undergo an ultrasound so that the provider can test for a fetal heartbeat. Rather than improving women’s health and safety, abortion restrictions have been designed to harass, guilt, and shame women and push abortion care out of reach. Already, too many women live in places where Roe has been rendered meaningless. Whole Woman’s Health, if dutifully applied by the courts, would stem the tide of laws that have shuttered so many abortion clinics. But a newly constituted Supreme Court, and lower federal courts that have been stacked with judges who are hostile to abortion rights, portend a future in which broad swaths of the country will have little to no access to abortion – all while Roe remains “settled law” but exists in name only.